Learn how to GROW your practice by connecting with women. High Net Worth women are looking for financial advice – and there are lots of them. But women want advice in a way that resonates with them. Invest in HER -- to take your practice to the next level learn how to be the advisor women flock to. If you want to better understand how to connect with women, Paulette and Judy have the research, expertise and experience to guide you! We turned to Paulette and Judy to provide the insight to develop our Woman’s strategy at NBF Wealth Management. They are knowledgeable and accessible – truly a pleasure to work with. Paulette’s and Judy’s voice on the women's market within financial services has been invaluable and much needed. StrategyMarketing.ca has been a leader in Canada in researching and documenting the increasing power that women hold as consumers. Working with Paulette and Judy has been critical in helping me transition successfully from advising institutional investors to advising private clients. are fortunate in being able to tap into an unparalleled depth of experience and understanding of the financial sector. Paulette and Judy have used their vast industry experience to help advisors connect, talk to and understand women. Their growth strategies are excellent in setting forward thinking advisors apart from the rest. In StrategyMarketing.ca women have a strong advocate and financial advisors have experts who understand how they build and grow their practices. Connecting these two forces is what this consultancy does best. Judy and Paulette are amazing! 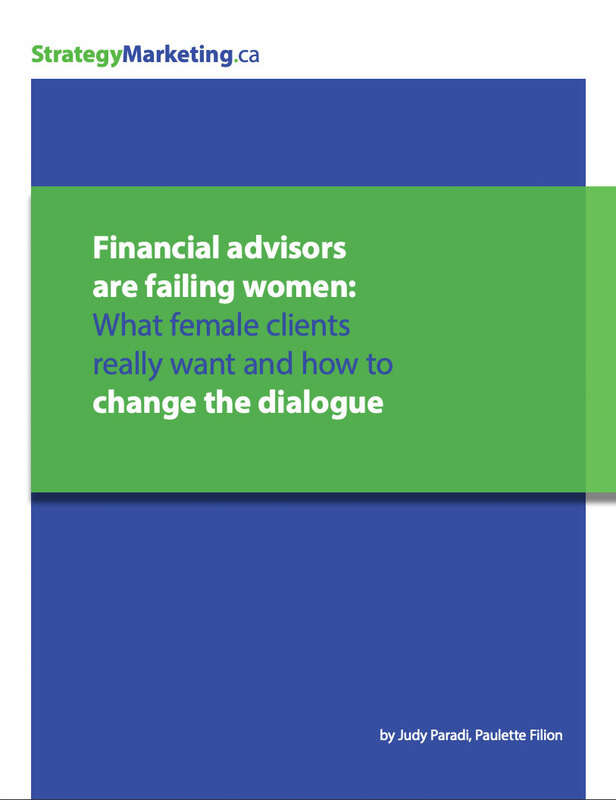 They work with advisors to ensure that women everywhere get financial advice on their terms. It’s an honour for me to salute their efforts.